Rajnandgaon is the domicile of the tribes like the Halbas, the Baigas, the Gonds and the Kanwars. They constitute about one fourth of the region’s populace. The tribal communities mostly dwell in the dense woods, in remote areas. Their chief source of living is by accumulating tendu leaves. They also grow trivial forest harvest. Asia’s one and only music university is found in the Khairagarh town, Rajnandgaon. This place is barely 40 kilometres from Rajnandgaon, a place of worship, which houses the twin temples of Badi Bambleshwari and Chhoti Bambleshwari. The former is situated on a 1600 feet summit whereas the latter is located at the ground level. 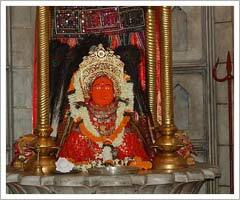 The place is treaded by thousands of devotees during Dassera or Kavar and Chaitra (at the time of Ramnavami). Apart from rituals and worship, the place hosts various cultural programmes and fairs or melas in the temple premises, during these times of the year. This is the only place in Chhattisgarh which has the facility of passenger ropeway.